Kinetic military boots generate power with each step #WearableWednesday « Adafruit Industries – Makers, hackers, artists, designers and engineers! Ecouterre posted about these awesome new boots from Lockheed Martin and STC Footwear that will help people in the military charge their devices just by walking around. Hop, skip, jump, march, dance, run or hike – keep at it for an hour while wearing these kinetic boots and you’ll be able to generate enough power to charge up your smartphone 3 times. Developed by Lockheed Martin in collaboration with STC Footwear, the Kinetic Boots are meant for military personal to charge up their devices and radios while on the move. 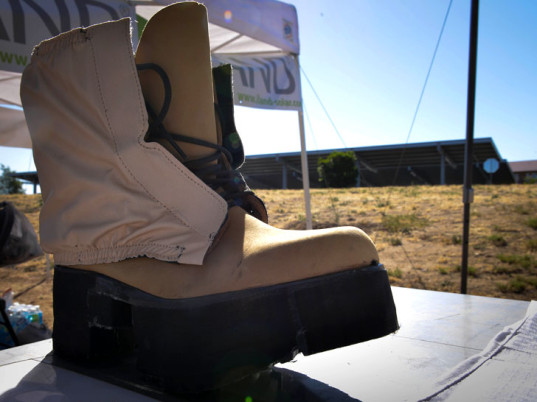 Adding only a few ounces of weight to each boot, this set up is much lighter than other solar and battery options soldiers are currently using. They also consolidate a piece of essential gear into boots that everyone already wears. Marines carry up to 15 pounds of batteries in order to charge all their devices while in the field. The batteries plus all their other gear can be a huge drain on muscles and the soldier’s energy. To lighten their load, Lockheed Martin wanted to come up with a way to generate power while on the move and minimize the additional weight. Their solution was to use kinetic energy generated from walking and moving and harness that via a soldiers boots. Lockheed Martin teamed up with Canadian boot maker, STC Footwear to integrate all the necessary component, like power generators, rechargeable batteries and power cords, right into the boot.